In 12 Rounds, John Cena plays John Cena, a "freakishly large" New Orleans beat cop who manages to capture the world's most super duper master criminal, played by Aiden Gillen. After breaking out of prison, Gillen returns to the Big Easy and takes revenge on Cena in the most ludicrous manner possible: He kidnaps Cena's girl (Ashley Scott, The Rock's love interest in Walking Tall, who seems to be making a career out of being the WWE Films moll) and forces Cena into a game of 12 Rounds, where Cena has to perform stunts across the city causing untold millions of dollars in property damage. 12 Rounds started out pretty decent, but watching Cena race across New Orleans grew tedious even before the signature action set piece where he stops a runaway trolley from exploding. Later, Scott reveals a previously unmentioned skill as a helicopter pilot and, when Cena leaps onto the skids to save her from Gillen, she decides to take the chopper on a joy ride across the city while her boyfriend gives Gillen an attitude adjustment instead of just landing the chopper. (Thank goodness for convenient hotel pools on rooftops.) The monosyllabic Cena shows little of whatever it is about him that's so captivating to 11 year old WWE fans and 15 year old girls. 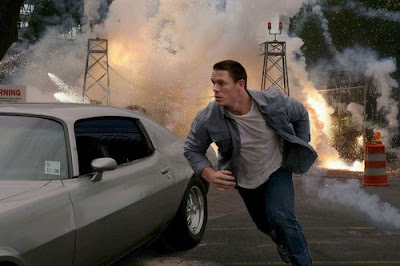 Cena maintains his wrestling character's invulnerability in the movie, such as when a house explosion blows him across the street into a parked car and he gets back up and brushes himself off. Gillen, so good as Mayor Tommy Carcetti in The Wire, apparently had the help of Macauley Culkin from Home Alone in rigging New Orleans into a deadly obstacle course. The only character who actually has an arc is the black FBI agent who didn't care if Cena's girl lived or died as long as he caught Gillen, but had a change of heart and joined the Chain Gang by the end. 12 Rounds is directed by Renny Harlin, who was once an A-list action director but has fallen on such hard times he now has a movie executive produced by Vince McMahon to his credit.